Wednesday, June 20, 2018 from 8 a.m. – 9 a.m.
As the consumerization of health care grows, more patients expect healthcare systems to offer convenient, personalized experiences. Having a system-branded mobile platform is a first step in that direction — but it’s important to ensure the mobile platform delivers distinctive, ongoing opportunities for adoption and engagement, one that builds a relationship with patients and puts all services and amenities at their fingertips. 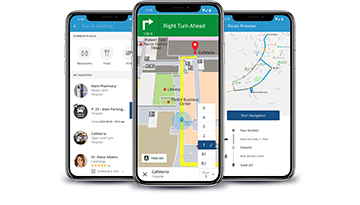 Katie Logan, VP Experience at Piedmont, discusses best practices for a mobile approach with indoor navigation and wayfinding as a key strategy. Her presentation details how Piedmont’s mobile platform addressed additional patient education and clinical improvements with features such as urgent care and emergency department wait times, find-a-doctor directory, virtual visits, and seamless appointment scheduling. Are you attending the 2018 Empathy and Innovation Summit? We would love to meet you in person and discuss Gozio’s mobile wayfinding and patient engagement platform. To schedule a demo, contact Barb Kragor.